^ 1.0 1.1 1.2 1.3 1.4 New York Formation Maps. Genealogy, Inc. [2008-01-20]. （原始内容存档于2008-10-24）. ^ 2.0 2.1 Beatty, Michael. County Name Origins of the United States. McFarland Press. 2001. ISBN 0-7864-1025-6. ^ Benjamin, Gerald, Richard P. Nathan. Regionalism and realism: A Study of Government in the New York Metropolitan Area. Brookings Institute. 1990: 59. ^ FIPS Publish 6-4. National Institute of Standards and Technology. [2013-07-21]. （原始内容存档于2013-04-23）. ^ 5.0 5.1 EPA County FIPS Code Listing. US Environmental Protection Agency. [2013-07-21]. （原始内容存档于2012-10-08）. ^ 6.0 6.1 6.2 6.3 Find A County. National Association of Counties. [2010-08-09]. （原始内容存档于2010-08-04）. 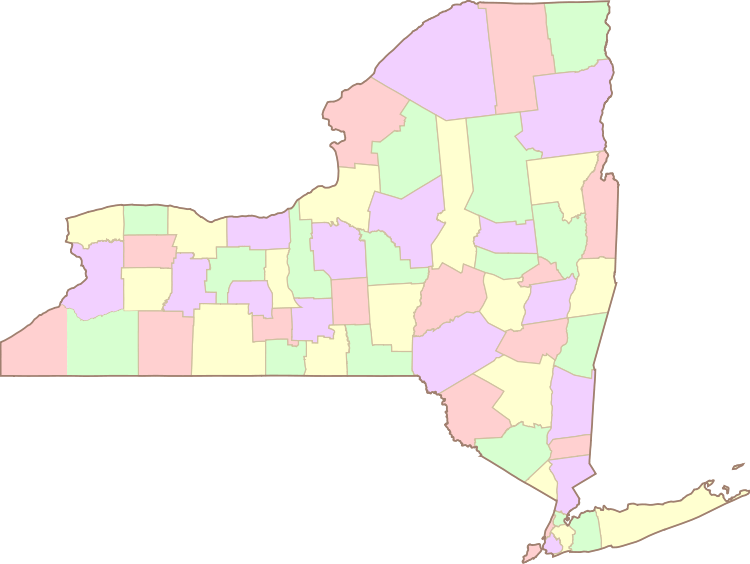 ^ Legislation splitting off Bronx County from New York County was enacted in 1912 with an effective date of January 1, 1914. Prior to 1874 the entire area had been part of Westchester County. See McCarthy, Thomas C. A 5-Borough Centennial Preface for the Katharine Bement Davis Mini-History. New York City Department of Corrections. [2008-01-25]. ^ Lynch, Mike. North Elba Supervisor Candidate Debate. Plattsburgh Press Republican. 2007-10-30 [2013-07-21]. （原始内容存档于2012-08-20）. ^ Healy, Patrick. Growth Pains and Clout Heading East in Suffolk. The New York Times. 2004-02-11 [2013-07-21]. （原始内容存档于2012-10-22）.